Last week was Spring Break. 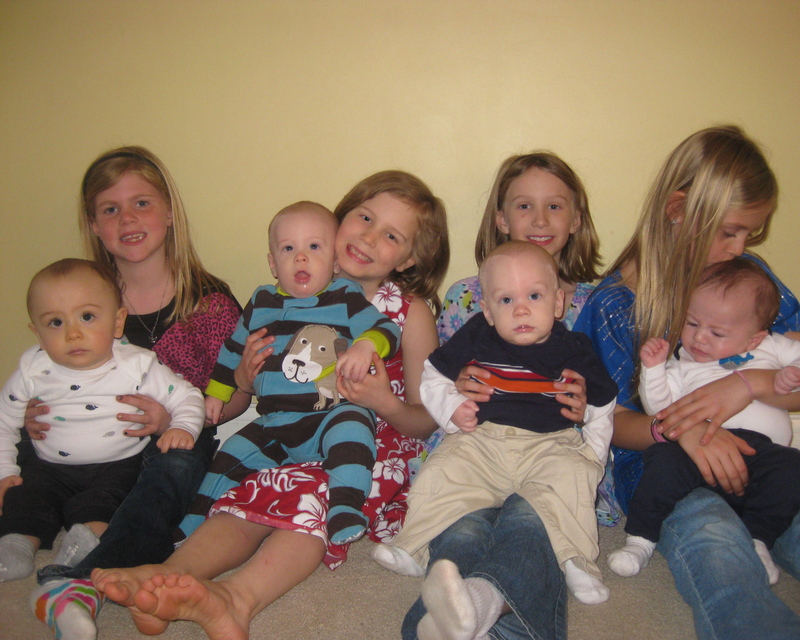 We had all nine grandchildren in the house for almost a week. Sickness struck halfway through and two of them came down with the flu. So did Grandma. On the last day, Sunday, our eldest daughter took her four children home to Indianapolis, to be ready for school Monday morning. For the remainder of the day I was the only functioning adult in the house, with a sick wife (Grandma) and three young children, one of whom is only ten months old. I’m thankful to say that the two oldest boys, 5 and 4, were perfectly well behaved and the baby was no trouble at all. On the Friday I was able to take my wife to Urgent Care, where they confirmed a diagnosis of influenza. Hers was a particularly bad strain. The doctor tactlessly added that it could be very serious “at her age.” She also added that she would be contagious for five days and should remain in bed. Just as well – she did not have the strength to move. Each day of Spring Break, I made it a point to take our four granddaughters out for some fun. The girls are all 10-12 and are generally happy doing things together. The first day the local library had a free session called “Game On” where children of their age could come together and play electronic games. On the Wednesday morning, another library offered a free magic show which was, apparently, very good. I was there, but I made the mistake of taking one of the 4-year-old boys with me – and he had difficulty sitting still, which meant that I could not sit still, either. From there, we had to rush back to go to another library for their Spring Carnival, games for children of all ages. Thursday, the same library offered a Lego afternoon. I used to play Lego with our children 30+ years ago, but now I find it extremely challenging as all the Lego pieces seem to get under my feet and cause me grievous bodily harm. So our two daughters took the boys, while I took the girls bowling, followed by milkshakes at Steak and Shake (half price shakes from 2-5). We had a lot of fun. Because almost everything was free the entire week. When you check out the library, there are so many “events” on over Spring Break, none of which cost anything. Before leaving “Game On” on the Tuesday, I asked two of the girls to check out the DVDs and see what we could take home to watch. They chose all four “Home Alone” movies. You didn’t know there were four? Neither did I, but I spent each evening watching them with the girls and quite enjoyed them. 8-year-old Kevin reminded me of 4-year-old Leeson – Leeson would definitely give any intruders a hard time! All five boys together are a more effective deterrent than the most vicious Rottweiler. Again, as with the activities, the movies were free. So if you are a grandmother about to host nine grandchildren for a week, remember the library. Even if it’s a place of refuge while you leave the grandkids at home with Grandpa. I love these weeks when we are all together. They don’t happen very often. Which is just as well – with all the “kids” here, I did not find time to write my blog, or even to keep up on the news. 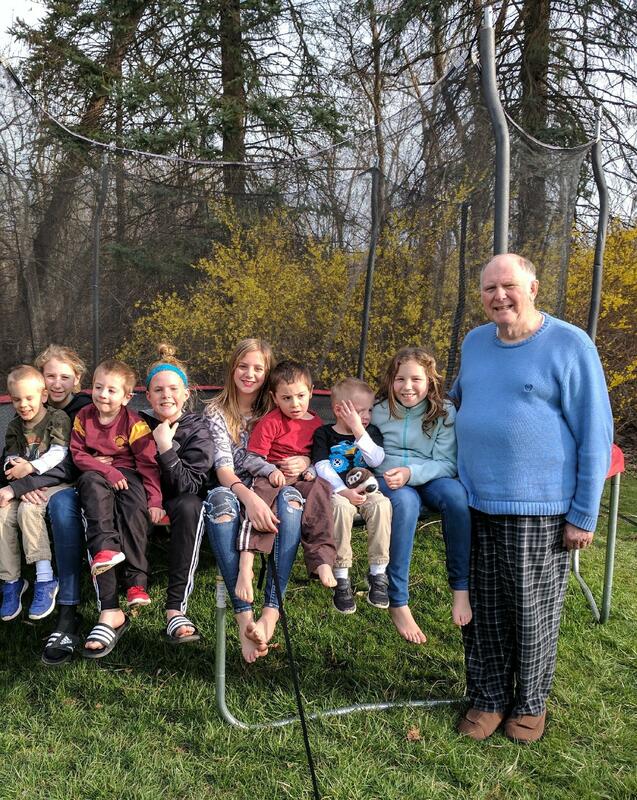 One thing I’ve learned, though, as a grandparent, is to give the grandchildren 100% of my time when they are with us. Nothing is more important than building good relationships within the family. Our ten-month-old grandson Hayden is not up to joining in any of the activities his older siblings and cousins are into, but he has taken a decided liking to the “Baby First” channel while he bounces up and down in his bouncer. The channel is produced with babies in mind – and their parents, who are ready to spend lots of money on that first baby! They have lots of singing of familiar nursery rhymes, cute little lambs running around on a farm in Wales and endless reruns of “Harry, the Bunny.” The channel will certainly entertain your baby, but how many grandparents have been driven nuts watching it is what I want to know??? A more serious matter is the never-ending wars we see each night on television. Syria and Iraq continue to dominate the news. It’s difficult to understand the full complexity of the fighting that goes on and on, year after year, in both countries. The West is appalled that President Assad has dropped chemical weapons on “his own people.” I should mention that he denies doing anything of the kind and has even asked “where are the dead?” when TV viewers everywhere have witnessed dozens of children convulsing, struggling to breathe and even dying on camera. Secondly, westerners need to learn that, to Assad, these are not his own people. His own people are Alawites, who number 11% of Syria’s population. The chemical weapon attack was on a village in Idlib province, which is overwhelmingly Sunni Muslim, with a significant percentage of Christians. Assad’s wife is from a Sunni background, but she seems to be in denial of everything that’s going on. We should remember, too, that what’s going on is the direct result of our meddling in the Middle East. We don’t need Mideast oil any more and Israel can take care of itself. Why are we there? The origins of the disaster that is the current Middle East go back a century to the Great War, otherwise known as World War One. The war led to the collapse of the Ottoman (Turkish) Empire, the last Caliphate. It gave independence, freedom (supposedly) to new nations like Syria and Iraq. Artificially created and not fully taking into account sectarian boundaries, the result has been a disaster. Interestingly, a hundred years after the fall of the Ottomans, the present Turkish president seems to want to restore the old empire and is projecting Turkish power into neighboring countries. He is also seeking more power for himself with a referendum on Sunday. “One hundred years ago, on a gentle slope in France, the four divisions of the Canadian Corps fought for the first time as one. They were ordinary – yet extraordinary – men, from all corners of the country: Francophone, Anglophone, new Canadians, Indigenous Peoples. “On Easter Monday, April 1917, battling through snow, sleet, and constant machine gun fire, they broke through an impregnable fortress and achieved a historic victory. They succeeded where other armies had failed – but at a great cost. Nearly 3,600 Canadians lost their lives. Over 7,000 more were wounded. The Battle of Vimy Ridge remains one of the bloodiest battles in Canada’s history. On the surface, these two paragraphs seem well motivated, but they overlook a simple fact. Amidst all the talk of people from many languages and backgrounds fighting for Canada is the simple fact that Canada has radically changed. A century ago Canada was very much a Dominion of the British Empire, sharing the ideals of Great Britain and its other dominions, Australia, New Zealand and, at the time, South Africa. These nations were committed to freedom and all fought together from Day One of what, at the time, was the greatest war in history. The nations were bound by a common loyalty to the Crown. Indeed, Prince Charles, the future King of Canada, was present at the same ceremony. So were both of his sons, who have served in the British military. What has changed is this: Canada is now much more multicultural. The very word originated in Canada, coined by a royal commission back in 1971. Today, immigrants are more likely to come from Africa, Asia and the Middle East, than from Europe. In the event of another conflict like World War One (or Two), would all these people be so willing to die for the values Canada has traditionally held? The prime minister’s speech ended with the traditional words used at events commemorating wars: “Lest we forget.” Sadly, the contribution made by Britain and the British dominions has been forgotten. This is also the centenary of America’s entry into world affairs. The country declared war on Germany on April 6th, 1917. After the war the US withdrew from further international involvement until 1941. Stefan Lofven is the Prime Minister of Sweden, the country that witnessed its worst-ever terrorist attack a few days ago when a migrant from Uzbekistan in central Asia drove a truck into a big department store. Sweden has had the most generous open-door policy in Europe during the migrant crisis. The prime minister has now said that will change. But nothing has changed, either in Sweden or anywhere else. It seems that western politicians are incapable of changing immigration policies. According to the late Albert Einstein (died 1955), this means that our politicians are mostly mad. Einstein defined insanity as “doing the same thing over and over again and expecting a different result.” Western nations endure one terrorist attack after another, yet they continue to allow Muslim immigration! Neither of these two men was addressing Islamic immigration, but what they said is certainly applicable. So, what should a Christian do? Western leaders are certainly guilty of upholding erroneous ideas. They can even be said to be of unsound mind. It’s doubtful either Einstein or Twain would alter their famous statements. In theory they should be voted out of office. But even when that happens (as with Brexit and Trump), it’s clear that very little is likely to change. >It’s 50 years since the Six-Day War between Israel and its Arab neighbors, a war which ended in a decisive Israeli victory and the fall of Jerusalem to the Israelis. Russia has now recognized West Jerusalem as the capital of Israel, at the same time recognizing East Jerusalem as the capital of a future independent Palestine. Will the US follow? >>AFGHANISTAN continues in the news, as the US has dropped its most powerful non-nuclear bomb on an area of the country with a very active ISIS presence. Three dozen were killed. Will ISIS be defeated with this more aggressive approach? If they are, will that be the end of Islamic fundamentalism? Doubtful. >>Another war may be brewing in the Far East, as North Korea pursues its nuclear program and threatens the South, Japan and the United States. Some voices in the US want war with the North. It should be remembered that, after three years of war from 1950-53, North Korea was not defeated and the US was forced into a stalemate. >>Libya continues to be engaged in a civil war, which has had a major impact on its economy. Reports this week are of African migrants being sold in the market-place as slaves, one way for locals to make money. In an appalling twist, those being sold are giving slave traders their cell phones so that captives can call home to ask for money. Relatives must listen while their sons and daughters are being tortured. >>Torture is the best way to describe a recent incident in Detroit, which will undoubtedly become more common with the numbers of Muslims increasing. A female Muslim Detroit doctor has been charged with performing GFM (Genital Female Mutilation) on two 7-year-old girls, a custom common in some Islamic nations. No feminists have yet raised their voice to condemn the incident in Detroit. Today is Good Friday, the day most Christians believe is the day on which Jesus Christ was crucified. When I was growing up, nothing was open on this day. We certainly had no school and I remember a discussion with one of my teachers a day or two before in which I asked why it’s called “Good” Friday. It was certainly a somber day and we all knew it. I’ve just returned from the bank and a store. Both were crowded. Times have certainly changed. The only god worshipped in today’s western world is the god of materialism. Nothing else seems to matter any more. We would do well to remember Acts 4:12: “. . . there is no other name under heaven given among men by which we must be saved.” Having forgotten this, the western world fails to see clearly the threat from Islam, thinking that all religions are equally valid or equally ridiculous, depending on your point of view. We live in Delta Township, which borders Lansing, the state capital of Michigan. There are a number of public libraries in the Greater Lansing area. Many of them are connected to the main library in downtown Lansing. However, some libraries are independent. That includes ours, and the one in East Lansing, the home of Michigan State University. For many years, I was a member of the East Lansing Library, which had the best selection of books out of all the libraries. I terminated my membership when they decided to charge non-residents the sum of $75 per year for using their facility. Our library in Delta Township has the best building of all the libraries in the area. It was opened about four years ago and is spacious with lots of natural light. It’s free to residents. Even though the book selection is not as good as East Lansing, it is able to borrow books upon request from any library in Michigan through what is known as Mel-Cat. In the last few months, I have tried not to buy any new books, as I tend to accumulate too many. Instead, I borrow from the local library or request books from other libraries through the local library. Only twice in six months have I been unable to get a book I wanted from one of the other libraries; and one of those times the local library bought the $35 book for me, which I was then able to read free of charge. Borrowing books helps in other ways, too. Typically, you have three weeks to read a book. That puts the pressure on to finish a 600-page history book ASAP. Two weeks ago I borrowed “Europe: the Struggle for Supremacy from 1453” by Brendan Simms, a 560 page thorough account of European history and the ups and downs of the German question. As somebody else also wanted it, I was given two weeks to read it, which works out at over 40 pages a day. At the same time I tried to borrow “German Europe” by Ulrich Beck, which is not yet available in any Michigan library. It is available on Amazon but I will not yield to temptation and buy it new! So far, there is no demand for Beck’s book in Michigan, which is interesting in itself. Germany has emerged under Chancellor Angela Merkel as the dominant European power. As Europe is the world’s biggest single market and Germany the world’s biggest single exporting nation, you would expect there to be an increased interest in the country. The library is not just a source of books. It also offers free DVD’s, which can be checked out for a week at no charge (there is a small charge for new releases). Again, they can get DVD’s from other libraries if you request one. These DVD’s include a lot of really good documentaries, travel films, fitness DVD’s and children’s films. Our grandchildren love to check out a couple of children’s films when we go to the library. We can also borrow books-on-tape (or CD). If you want somewhere quiet to work away from home, private study rooms are available. Computers are available for use, or you can bring your own. They also offer regularly scheduled activities for young children, including a “Baby Time” for two-year-olds. The children get to sing along with the “teacher” and the accompanying parents; afterwards they can play together. Once a month, they have a free movie afternoon with popcorn for families. Libraries have changed a lot since I was a child. Back then you went to the library to borrow books and records (remember records?). There wasn’t anything else available. Today, there’s plenty available at and through your local library. No matter what your income, everything is free (for local residents). It all comes out of our local taxes. Be sure to check out your library and make good use of what’s offered there.